We stock a range of Enigma bikes with the Enigma Excel being the most popular here at Lifecycle Uk and with many of our customers. 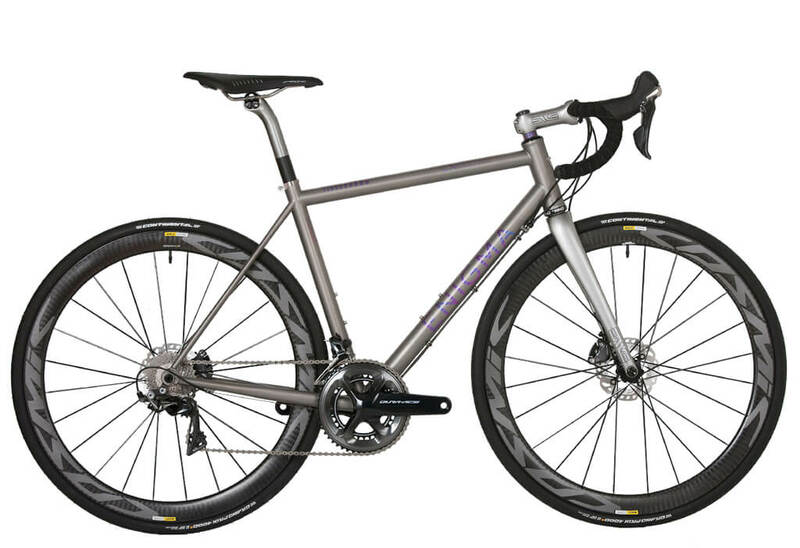 The Enigma Excel is built with 6AL 4V titanium with the latest generation disc brakes and makes for a responsive bicycle with sharp handling and a beautifully compliant ride. The Excel is Enigma bikes flagship model — handcrafted to perfection in their Sussex workshop by a team of skilled craftsman. Many of you I’m sure are asking — what is 6AL 4V? Well, here is the answer – 6Al-4V Titanium is an alpha-beta titanium alloy with a high strength-to-weight ratio and excellent corrosion resistance. It is one of the most commonly used titanium alloys and is applied in a wide range of applications where low density and excellent corrosion resistance are necessary such as the aerospace industry. The Enigma Excel is available in a variety of finishes. The Excel Disc is available in a shot blast beaded, anodized or painted finish as standard so you don’t have to pay more to personalise the bike to your taste. We can highly recommend Enigma finishes and we rate their paint works studio as second to none. The Enigma Excel is certainly a tour de force in terms of materials and frame building expertise. A recent update includes a new 6AL 4V precision engineered 44mm down tube which enhances the capabilities and proficiency of the frame. Adding high-quality finishing work, the Excel Disc has cemented its place as one of our highly recommended titanium frames. Frame handcrafted in Great Britain under the Enigma ‘Signature’ program. Grade 5 6AL 4V titanium alloy tube set with new precision engineered, heat treated 44mm down-tube. 44mm machined for inset headset types. Compatible with integrated or tapered steerer forks. Chris King compatible 12mm thru-axle rear dropouts. Paragon flat-mount disc brake mounting. 31.6mm seatpost for added stiffness. Clearance for up to 28c tyres. All of the Enigma bicycles are highly configurable to the customer’s requirements and we don’t stock Enigma bikes ‘off the shelf’. However, we usually have an example in the shop or they may be a customer bike in the workshop for servicing. We ask you to call the shop first to see which sample Enigma we have in the shop and to discuss details of what you are looking for from the range of Enigma models. And every new bike or bike build gets a free MorphoLogics bike fit – just quote ‘Freefit‘ when you call or visit the shop.